2017 June 03: Updated version of "The Sky is Open House". PDF. 2017 April 17. 21h 14m UT. 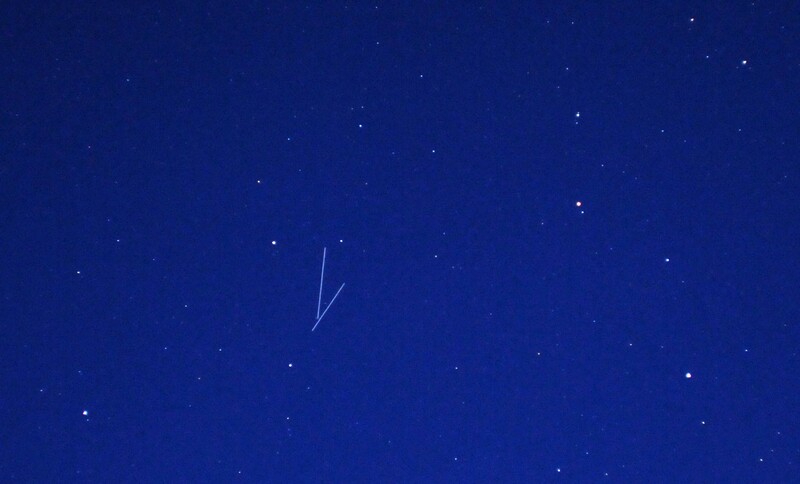 We observed in the course of just 7 minutes 23 bright artificial Earth satellites in the region of Virgo and Leo. We were attempting to work on Jupiter at the time. 2017 March 23: Venus in morning sky. 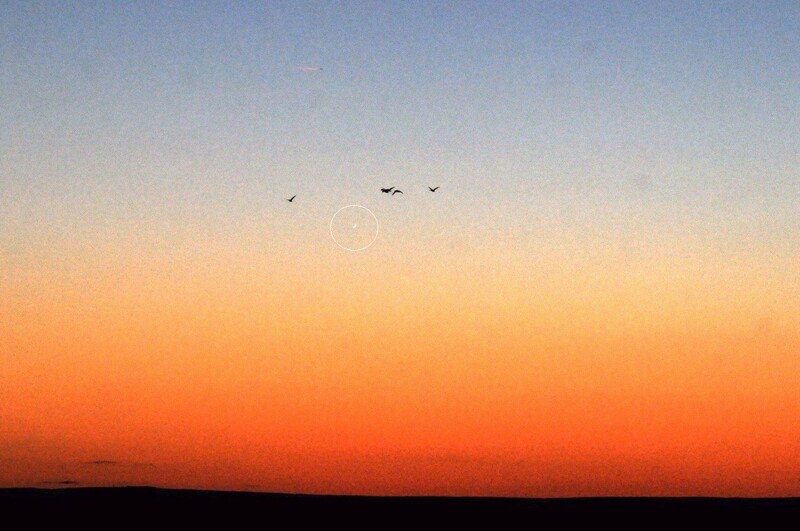 Venus in company with geese in flight early morning Thursday 23 March. The planet is to be found at the centre of the white circle between the leading and second bird. The crescent phase is clearly visible, if a little exaggerated due to over-exposure. D300 SLR 130mm f/2.8, 1/400 sec. Looking due east from Rousay with Eday on the horizon. 05h 32m UT. On BBC Radio Shetland, evening January 13th, a lady in Shetland was heard to describe a bright light in the sky billed by the programme as an encounter with a UFO. The light appeared to puzzle folk up in Shetland, but is was almost certainly planet Venus nearing maximum brilliance, bright enough in fact to be seen with the unaided eye in full daylight. 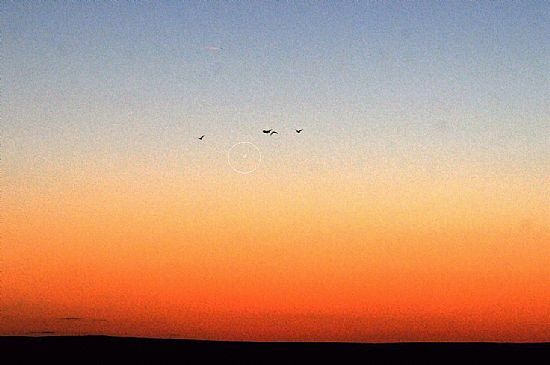 A similar mistaken identity with Venus took place way back in 1974 during the so-called three-day working week when folk in Wales reported to us a bight object in the pre-dawn sky. Economy measures put in force meant that street lighting and so forth were restricted thereby making it possible to actually see stars and planets in the natural sky! The image attached was taken from Rousay this evening, 2017 Jan. 13 at 18h 16m UT. There just happened to be a helicopter passing at the time as may be seen from the trailing images. 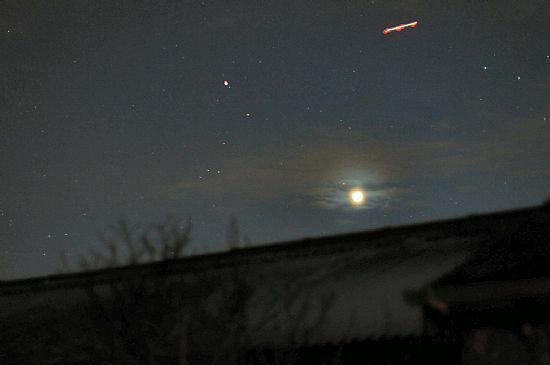 Planet Venus is shown in light cloud bottom right with planet Mars to the left. On a dark night, away from artificial or other lighting, Venus will cast a shadow visible to the unaided eye when close to maxim brightens. 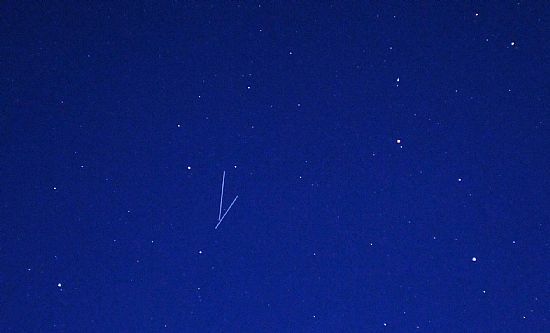 Venus is currently at apparent visual magnitude –4.4 making it approximately 18 times as bright as Sirius, the brightest star in the entire sky, apart from the Sun itself of course. 2016 LEAP YEAR: Background information.